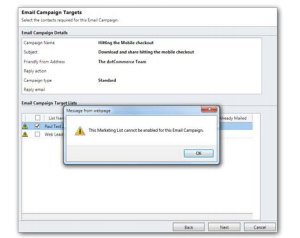 To access Email Campaigns, select Marketing from the menu bar, and then select Email Campaigns. The Email Campaigns screen is displayed. This screen displays a list of Email Campaigns in a tabular format. Summary information relating to each campaign can be seen by reading across each row. This provides an at a glance view of the status and progress of the campaign. You are able to filter and search upon this list using standard Microsoft® Dynamics CRM functionality. Email Campaigns are created in OpenMoves, then synchronised to Microsoft® Dynamics CRM for sending and tracking. Step 1: Create your Email Campaign in OpenMoves. 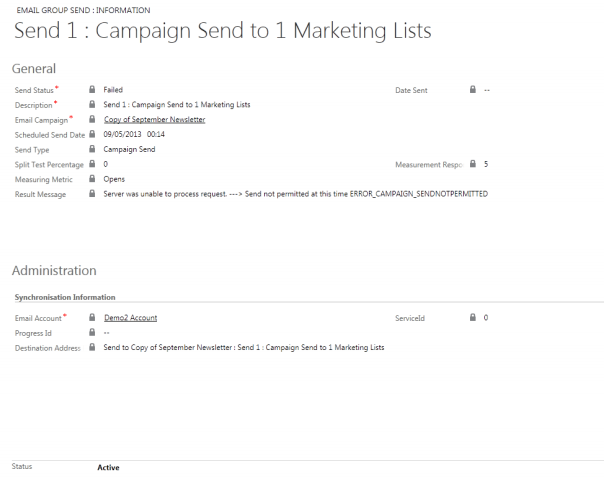 Step 2: Within Microsoft Dynamics CRM, click Marketing then Email Campaigns to access the Email Campaigns screen. i) If your Email Campaign is displayed, click on the Campaign Name to display the Email Campaign Information screen. ii) If your Email Campaign is not displayed you need to synchronise Microsoft® Dynamics CRM with OpenMoves. Click “Synchronise”. A pop-up window is displayed. iii) If you do not have appropriate access rights, a pop-up window shall appear advising you that you are unable to complete synchronisation. You should contact your Systems Administrator if you think you should be able to perform this task. iv) If you do have the appropriate access rights, a pop-up window shall appear advising that ‘Email Campaigns have successfully been added to the synchronisation queue.’ You should allow several minutes depending on the amount of data to be copied before you refresh your screen. When the synchronisation process is complete, your Email Campaign shall appear in the table. Click on the Campaign Name to display the Campaign Information screen. Clicking the ‘Synchronise’ button retrieves details of new Email Campaigns as described above. You will need to synchronise with OpenMoves regularly throughout the life of the Email Campaign to retrieve response data. This is completed automatically at timed intervals pre-determined by the Email Campaign Manager but it is possible to manually synchronise in addition to this. You may be working on an Email Campaign and wish to retrieve the latest statistics immediately without waiting for the next automatic synchronisation. 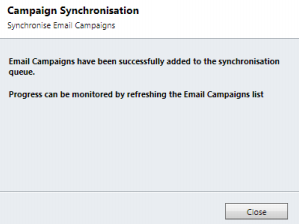 You can use the ‘Synchronise’ button on the Email Campaigns screen to do this, or to synchronise a specific campaign you can use the ‘Synchronise’ button on the Email Campaign Information screen. This option available from Email campaigns and Account Settings and enables any mapped user to directly enter OpenMoves from within Dynamics. This then allows the user to create campaigns, automation programs, manage contacts and use all of the OpenMoves functionality, without ever having to leave Dynamics CRM. To access a specific campaign, click Marketing in the menu bar, then select Email Campaigns to display the Email Campaigns screen. Click on the Email Campaign you wish to view. Clicking an option in the menu opens a new window. This section displays non-editable basic information relating to the Email Campaign, such as Campaign Name and Subject. This data originates from OpenMoves and also displays Send Information, showing when the campaign was last sent plus any split test details. This section provides graphical summaries of the engagement statistics, such as Top 10 Clicks, Bottom 10 Clicks, Email Opens by Date First Opened, etc. 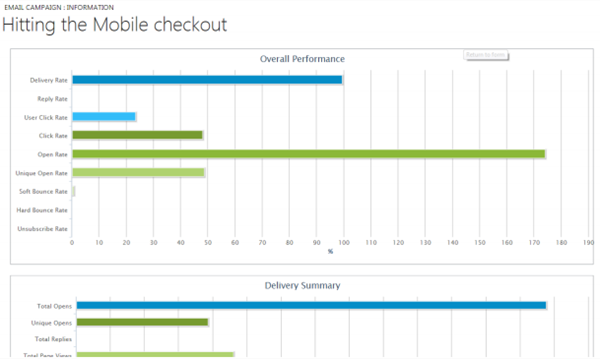 These statistics are retrieved from OpenMoves and made available within Dynamics CRM. This section displays a summary of the number of views generated by your Email Campaign after being shared on social networks via the OpenMoves social network bookmarking tool. Note: this is a partial screenshot and does not display all the statistical information available. This section displays statistical information relating to delivery of emails within this campaign. For example, the ‘Delivered Rate’ shows what percentage of total targets received the marketing email. This data is collected by OpenMoves and synchronised to Microsoft Dynamics CRM. It is non-editable in Dynamics. This section manages the synchronisation settings for the Email Campaign. Synchronise this Campaign? box will ensure that campaign data is updated from OpenMoves when automatic or manual synchronisations to Microsoft® Dynamics CRM are performed. Unchecking this box prevents any updates taking place. Synchronisation Level has two values, Basic and Detailed. Basic is automatically set if the send was made from OpenMoves, only the summary statistics are synchronised and displayed in the email campaign record. Detailed (Basic plus individual tracking) ids the default settings if the send is form Dynamics. It updates the individual send summary and tracking data for each lead and contact. The checkbox ‘Allow Repeat Sends to the Same Recipients?’ is defaulted to unchecked. This ensures that an individual email address is only mailed once, even if they belong to more than one of the marketing lists associated with this campaign. You can check the box if you do not wish this to apply. General notes for the Email Campaign are displayed in this section. To add a new note, click the hyperlinked text. This tab displays graphical representations of data for the campaign. Further data is available by hovering the mouse pointer over the relevant area of the chart or graph. Every time an Email Campaign is sent an ‘Email Group Send’ record is created. This is effectively a send batch and an Email Campaign may consist of one or more batches. If the send fails it is also recorded. The Send Summary Section displays a table of all targets of the campaign in descending order of Date Sent. The list can be filtered using the pick list above the table to refine the data displayed. For example, you can view only those recipients who opened the marketing email. Scrolling across the screen provides more detailed information such as how many times the recipient opened the mail and the first and last times they did this. You can also filter using the View pick list to display the Account, Contact or Lead name rather than the recipient email address. Clicking on a record opens the Entity Information screen (e.g. Contact Information screen). This section displays only those recipients who have clicked within the marketing email, in descending order of click date and time. The data can be filtered by the URL that they clicked upon, enabling you to view only those recipients who clicked on a particular link within the email. Clicking on a record opens the Email Click Information screen which displays the same data in non-editable fields rather than a tabular view. Once the appropriate page tracking script has been installed and configured on your website, this section shows recipients’ activity on your website after they have clicked through from your campaign. It will also show WebInsight data if it is activated on your account. The data in this section is synchronised from OpenMoves which will track and report on any transactional events on your website resulting from an Email Campaign e.g. purchase of product, or download of a whitepaper, etc. This section displays the views generated by your campaign after being shared on social networks via the OpenMoves social network bookmarking tool. Selecting Target Marketing Lists displays the marketing lists that have been associated with this Email Campaign. Click on an item to display the Marketing List information screen (see Marketing Lists section for more details). You are able to create a new association to a marketing list by clicking ‘Add Existing Marketing List’. Step 1: Click Add Existing Marketing List. Step 2: When the pop-up window is displayed, use the search fields to find the list you require and click the magnifying glass icon to display the results. Step 3: Tick the list(s) you wish to add and click ‘Add’. Your selected lists appear in the table at the bottom of the window. You can move them back again if you wish to change your selection by highlighting the list(s) and clicking ‘Remove’. See screenshot below for illustration. Step 4: When you have selected the list(s) you require, click OK. Step 5: The pop-up window closes and the list(s) selected appear in the table. Step 1: Click Synchronise Campaign. Step 2: A pop-up window is displayed advising that the synchronisation request has been added to the queue. You should allow several minutes or longer depending on the amount of data to be copied before you refresh your screen. The Administration option displays the date and time of the last synchronisation. Used to execute the Email Campaign and instructs OpenMoves to send the marketing emails. See Sending an Email Campaign. Selecting this option displays the OpenMoves campaign in a popup window. Standard OpenMoves reports for the selected Email Campaign can be accessed from this option. Select the report you wish to view from the pick list. Selecting this option will toggle between the Email Campaign being Active and Deactivated. In the deactivated state it is not possible for the Email Campaign to be sent. Emails are sent and responses received by OpenMoves but you can initiate the process, and view statistics, from Microsoft® Dynamics CRM. The Send Email Campaign Wizard guides you through the sending procedure. Note: You can use the Back button in the Wizard pop-up window at any time to return to previous screens and make changes. Screenshots to illustrate this process are shown at the end of this section. Access the Email Campaign you wish to send by clicking Marketing then Email Campaigns. Locate the Email Campaign you are working with and click to open the Email Campaign Information screen. Before proceeding, you should ensure that you have associated the appropriate marketing lists with your campaign. Step 1: Click Send Email Campaign in the tool bar at the top of the screen. 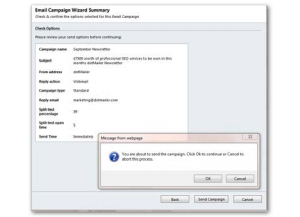 Step 2: A pop-up window ‘Welcome to the Send Email Campaign Wizard’ is displayed. Click Next. ii) The list is associated with a different email account. You can mouse-over the icon to confirm the reason. Step 4: Select each list that you would like to email by checking the box next to the list name. i) If any of the selected lists are not email-enabled a pop-up window appears now, providing the opportunity to enable the list. Click OK to email-enable the list and close the pop-up. ii) If any of the selected lists are associated with a different email account a pop up window appears advising ‘This Marketing List cannot be enabled for this Email Campaign’. You will not be able to select this list for use with your campaign. Step 5: Click Next to proceed. 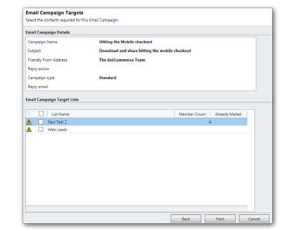 Step 6: The Email Campaign Targets Counts screen is displayed. This shows the total targets available for mailing, breaking out any which have been excluded for suppression, duplication, etc. If there are exclusions, the lower part of the screen displays a pie chart graphically illustrating the reasons for exclusion. Click Next to continue. Step 7: The Email Campaign Options screen is displayed. From this screen you are able to choose whether to send your campaign immediately or at a pre-determined date and time in the future. If you created a Split Test campaign you are able to set your specifications for sending (% of targets to send initial batch to/delay period/measuring metric). Once you have set these, the Summary area of this screen displays your selected timescales and details of how the emails will be split (if applicable). Click Next to continue. 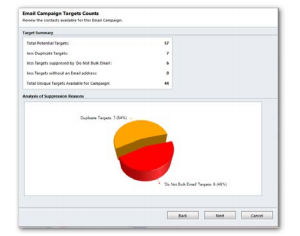 Step 8: The Email Campaign Wizard Summary screen is displayed to allow you to check the details of the campaign before it is sent. Click Send Campaign to proceed. A pop-up message advises you that you are about to send your campaign. Click OK. Step 9: The Email Campaign Completion screen is displayed advising that your Email Campaign has been added to the queue for processing. You can close the window by clicking the Close button. Your campaign shall now be processed by OpenMoves. Prior to this taking place, the mailing lists you have used will be synchronised with OpenMoves address books. The status of your campaign can be reviewed by refreshing the data on the Email Campaigns screen and you can review the members emailed by drilling into your campaign from here and selecting the Send Summary tab. This option available from the Email Campaign page is used to display the Email campaign as it will appear on a monitor, the screen will scroll if necessary. It is a live preview so will reflect all changes/updates carried out in OpenMoves. Close the screen when required. To access the Email Group Send Information screen, select Email Group Sends from the menu bar on the Email Campaign Information screen, and then click on an item. The Email Send Information screen is displayed. What is an Email Group Send? Every time an Email Campaign is sent an ‘email send’ record is created. An ‘email send’ record consists of a batch of emails, and an Email Campaign may consist of one or more batches. This screen is divided into a number of sections. The menu bar can be used to view further information about the Email Send batch. Clicking an option in the menu bar refreshes the main body of the screen. This option displays non-editable basic information relating to the email group sends, such as Send Status and Date Sent. Description – the description is automatically generated and comprises of the chronology of the Send (e.g. Send 1, Send 2, etc.) and how many marketing lists were used for this send. Date Sent – shows the date and time when the sending of the batch was completed. Scheduled Send Date – shows the date and time when the batch was scheduled to be sent. Likely to be different from ‘Date Sent’ due to processing time required for batch. 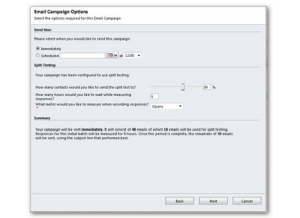 Send Type – non editable, ‘Campaign Send’ displayed. Split Test Percentage – (split test campaigns only) displays the percentage of targets that were to be mailed in the initial wave. Measuring Metric - (split test campaigns only) the measure by which OpenMoves will determine which Subject Line should be used for second wave of emails. Result Message – shows the Send Summary giving details of how many targets were mailed successfully and how many were suppressed/other rejection reasons. This tab displays automatically generated system information which is non-editable. Email Account - the OpenMoves email account that was used for the send. Destination Address – shows the address where the email will be sent to. Displays the main screen with tabs as described above. This tab displays all recipients for the batch. This table can be filtered using the pick list to show, for example, only those recipients who clicked an email. You can also change the view to show actual contact names rather than the receiving email address if required.